With a cast of thousands the local Scouts, Cubs, Guides and Brownies entertained the residents of Handcross in the Parish Hall. Some names appeared on the reverse of the photograph and I have named a few more but please can anyone help with naming the “unknowns”? The Large Version shows the 73 participants numbered. 1 Iris Sherlock, 2 Joan Leppard, 3 Margaret Briggs, 4 Sylvia O’Shea, 5 Marion Hobden, 6 Ruby Boxall, 7 Tony Cosens, 8 Ronald Newman, 9 Frank Sayers, 10 Barry Ray, 11 Sid Sargent, 12 Unknown, 13 Unknown, 14 Chris Wilkinson, 15 Eric Parker, 16 Alan Streeter, 17 Margaret Jakes, 18 Daphne Gates, 19 Heather Gates, 20 Vivienne Stoten, 21 Unknown, 22 Colin Boniface, 23 Pauline Wilson, 24 Ann Emery, 25 P Woodjetts, 26 Diane Gasson, 27 Janet Boxall, 28 Sally Chamberlain, 29 Penny Sargent, 30 Unknown, 31 Unknown, 32 Josephine Housby, 33 Unknown, 34 Raymond Trickey, 35 Mrs Lily Jakes, 36 Chris Johnson (Nashlands), 37 Arthur Fiest, 38 Deidre Ansell, 39 Valerie Elliott, 40 Susanne Copeland, 41 Sally Ray, 42 Rosemary Kinnard, 43 Ronnie Cosens, 44 David Knape, 45 Norman Leppard, 46 Donald Wheeler, 47 Barry Cox, 48 Andrew Sargent, 49 Wendy Emery, 50 Daphne Boxall, 51 Janet James, 52 Gillian Leppard, 53 Margaret Rice, 54 Doreen Kemp, 55 Bridget Biggs, 56 Penny Housby, 57 Joy Greenfield, 58 Rosemary O’Shea, 59 Sue Brown, 60 Kathy Rice, 61 Yvonne Newman, 62 Janet Housby, 63 Unknown, 64 Dawn Walder, 65 Wendy Cheeseman, 66 Irene Venn, 67 Wendy Brunger, 68 Gillian Carter, 69 Barbara Housby, 70 Margaret Pateman, 71 Brenda Fraser, 72 Anne Fiest, 73 Beryl Glover. 65 Wendy Cheeseman. 59 Sue Brown. 24 Ann Emery. 49 Wendy Emery. 3 Margaret Briggs. 4 Sylvia O'Shea, 60 Cathy Rice. I also think the year is 1954 or 1955. Or maybe 1953 for the coronation of QE2. Sally, I have adjusted the list above to include these names. Thank you. From the Troop Register I have listed the dates the scouts joined, usually "upgraded" from the cubs. 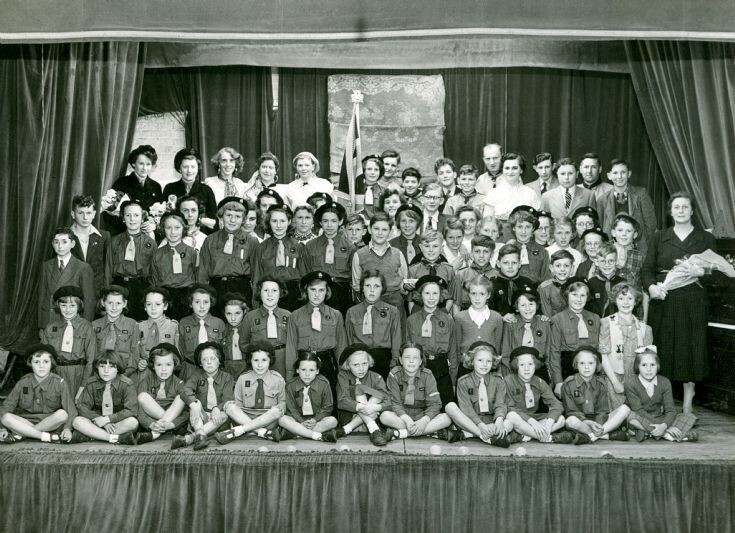 The date of the photograph cannot be 1953 as David Knape, Norman Leppard, Barry Cox and I did not join the scouts until 1954. I think 70 is Margaret Pateman. Hi again, no 53 is Margaret Rice.